Historical events and facts of interest in and around Bastrop, Texas. 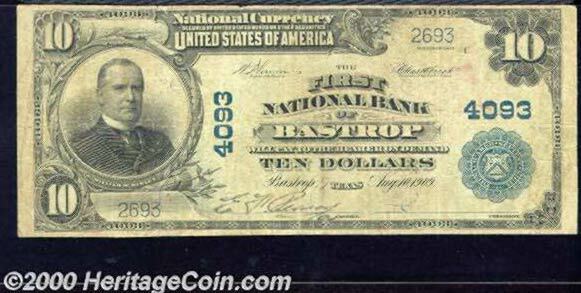 First National Bank of Bastrop, TX, Charter #4093. Series of 1902. $10 Third Charter Plain Back, Fr-626, Fine. This pleasing example has only one signature and the colors are slightly faded, but it is well centered and solid for the grade. The census reports that only two large size notes have survived from this bank that was chartered in 1889 and was the only bank in town. Only $810 in large currency was outstanding in 1935. This item was recently auctioned by Heritage Rare Coins of Dallas, Texas. The following movies were filmed in Bastrop. The information is from the Internet Movie Database: "http://www.imdb.com". The ones that say TV are made for TV movies. The last numbers are the ratings out of 10. You can also find a list of Texas movies at http://www.governor.state.tx.us/film/filmography.htm. If you would like to correct or add anything on this page that involves Bastrop, Texas, please let us know! E-mail: neil@bastroptexas.net.